I probably speak for many of us smart and pretty people if I say that today has been my favourite day so far! Now, “I’d like to take a minute, just sit right there – I’ll tell how we became students of life in a town called Prishtina” (Maybe, maybe not Will Smith, 1990). All fresh and fruity, as we only had to meet at Newborn at 11, our first stop was EULEX. Although it was an interesting visit, I did not find it very inspiring. One of the students raised the issue of allegations of corruption within the EULEX, which could have been the starting point of an interesting conversation. Yet, the spokesperson (who was, interestingly, placed in the center of the three) came with a vague and politically correct answer, not even answering the question. I did not come to EULEX to hear the same things I could read on their website. Altogether, our visit felt mechanical and not-human to me. One of the most significant questions that one could ask to EULEX is when it can be considered that EULEX has done its job and it can leave Kosovo. Unsurprisingly, our charming and well-spoken spokesperson somehow managed to ignore the whole question. Next up: the Youth Assembly. 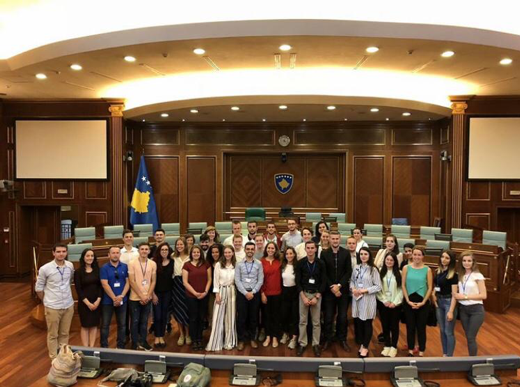 In a country in which the average age is 26, 28 or 30 (depending who you ask…) I was extremely excited to meet young, like-minded students in Kosovo. Besides the content of what we have discussed, among others youth empowerment and where their money comes from, what I found most interesting is how welcome we were. They all seemed so, so excited to get to know us, reflected by the fact that afterwards they went with us for some drinks at Soma, and later in the evening again in Bon Vivant. Unlike the EULEX visit, it all felt very honest. After that, we all made our way to the Parliament building. One of our pretty and smart students asked about the 5 main topics being discussed in parliament, after which the interpreter jokingly said “corruption, corruption, corruption, corruption and corruption”. Although everyone, including me, were laughing about this answer – it was actually, everything but funny. Besides corruption, it was visa liberalization, demarcation of border and the role of the army that were the other main discussed topic, according to the interpreter. Interestingly, this perfectly corresponds with what is brought up in class or during my interviews. After that, we all went together to Soma. This kind of day was exactly what I was hoping for when I registered for Peace Lab, yet I ended up being somewhat disappointed with the students not being around at the University of Hasan Prishtina and the University of Pristina Mitrovica. When it was time to go to our next meeting with Albin Kurti, the Youth Assemblers refused to let us pay. They taught me the Albanian custom called ‘Konak’, which loosely translates to house. This means that if you are kindly invited by someone, whether that is inside that person's home or outside – that person is expected to pay. I tried my very very best to implement Anne’s advice to pay the bill as a way of thanking people for their time, but I failed miserably. There was no way around it. I loved the fact that they posted this on their Facebook Page immediately after we left. Next up: the infamous Albin Kurti, leader of the main Kosovar opposition party Vetevendosje. He set the tone within the first paragraph, when he opened his half-an-hour, nonstop, mesmerising speech with “We do not think of politics of representation – but activation”. This philosophy soon became clear, reflected by the fact that he called Vetevendosje a social movement. Not a political party. He completely blew our mind. He nearly convinced me with his impressive rhetoric of Monsters evolving into human beings, Russian octopi and quadri-puses, elevators and catapults and tables lacking agency – together with all the dates and facts he threw at us. Halfway through his ‘speech’, I stopped taking notes. I realized that the take-away message of this meeting was not necessarily the content of what he was saying – I mean, everyone could support his “education&jobs – universities&factories” dichotomy, but, to me, the real lesson here was a lesson of critical thinking. With a confident voice that you almost forget to think critically. When I realized that, I started noticing inconsistencies. For example, when Albin Kurti replied to the question on reaching democracy through undemocratic means, he warned that “what is valid for the individual is not always valid for society’, yet afterwards heavily critized the UNMIK for ‘not thinking about the individuals but only about what is good for the state’. After the meeting, we were all in strong need of a drink, and most of us went to Soma for dinner. I don’t think there was any other meeting after which we spent hours debriefing. Unsurprisingly, it did not take long before everyone ordered fancy cocktails, beer and wine. 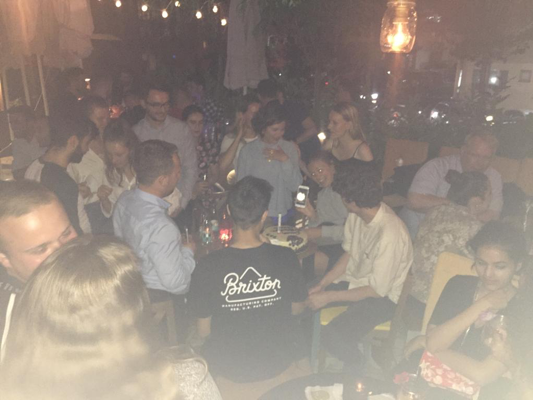 Around 10 we left for Bon Vivant, Bartha’s favourite bar in Prishtina (and now, three days later – also mine). 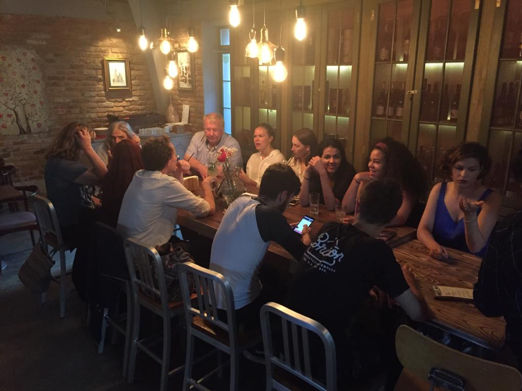 Although I would have preferred to get to know ‘Kosovar’ cafés, as Bon Vivant was a mixture of Colombian and Cuban vibes, Bon Vivant is a lovely place. After a while the majority of Youth Assemblers joined us. Bartha arranged a cake as a surprise for the birthday girl Chiara!